Buying a smaller block doesn’t have to mean your choices will be limited when selecting a home design. 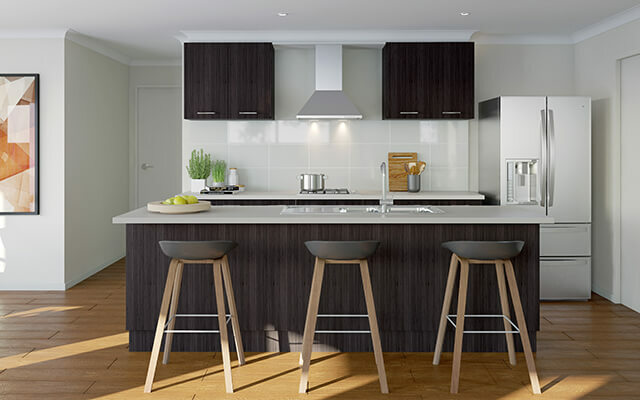 If you’re looking for something with contemporary styling, loads of features and plenty of space, all while still fitting within your budget, we’ve got options galore when it comes to finding an ideal home design to suit a smaller block. With 19 home designs suitable for blocks under 12.5 meters wide, you really can take your pick of the bunch when you build with Dennis Family Homes. Take for example the Edgewood, which offers an incredible 22 squares complete with everything you need, while conveniently being able to fit on lots as narrow as only 10 meters. 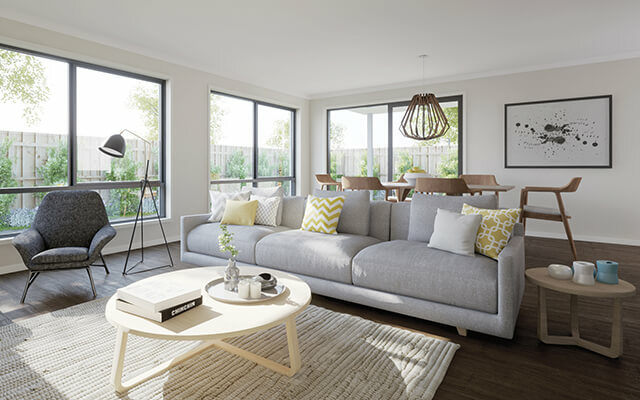 It’s compact double story design and smart floorplan means you won’t have to sacrifice on space, with three bedrooms, two living areas, a separate study and an open-plan design that flows beautifully out to the yard. If you prefer single storey living, the Olinda could be a great option. 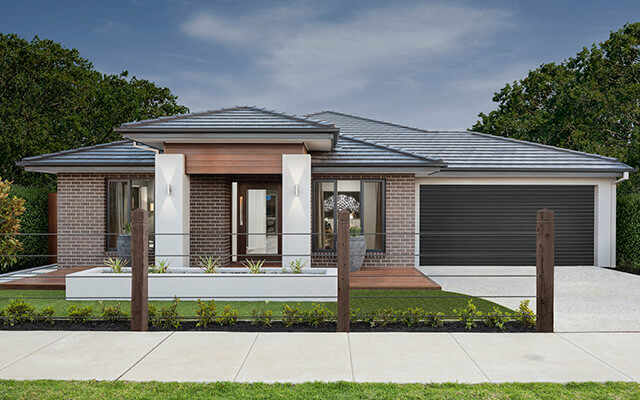 With a striking portico entry, four bedrooms, two living spaces, a spacious master bedroom with walk in robe and double ensuite as well as a gourmet kitchen complete with a large walk in pantry, you really do get it all with this compact home design. We even have home designs for the narrowest of blocks, like the Ardina, which can fit on blocks as small as 8.5 meters wide. The three bedroom, two bathroom design offers low-maintenance living without sacrificing on features, like a walk in robe and ensuite to the master bedroom and a stylish island bench in the kitchen. We also offer more than 20 home designs which are suitable for blocks with a depth of 25 meters or less. Measuring in at just under 15 meters in length, the double-storey four-bedroom Topaz is a sure crowd pleaser. It’s hard to believe we’ve packed an incredible 25 squares into this home design, with almost 20 squares of dedicated living space. Boasting two living areas, a separate study and a gourmet kitchen complete with walk in pantry, you certainly won’t feel like you’re strapped for space with this gem! The Sapphire is another home which will surpass your expectations, fitting an incredible 29 squares into a floorplan under 15 meters long. With an impressive kitchen complete with a large walk in pantry paired with an incredible three living spaces, it’s a stylish home with plenty of room for the whole family. But the bedrooms are where the Sapphire really sets itself apart—not only does the master bedroom feature a spacious walk in robe and ensuite, each of the four bedrooms also come with their own walk in robes, adding to the sense of luxury in this family home. If you’re not a fan of double-storey living and would prefer a single storey home, it’s hard to look past the Ekati 18. With a double garage, a master suite complimented by luxurious his and hers matching walk in robes, a walk in pantry to the kitchen and your choice from a range of contemporary facades, this home is loaded with all the features you’d expect and more. By speaking to one of our Dennis Family Homes consultants, we can make the process of finding the ideal home to suit your family, lifestyle and budget easy. Simply call us on 1800 336 647, send us an online enquiry or visit one of our display centres to get started.